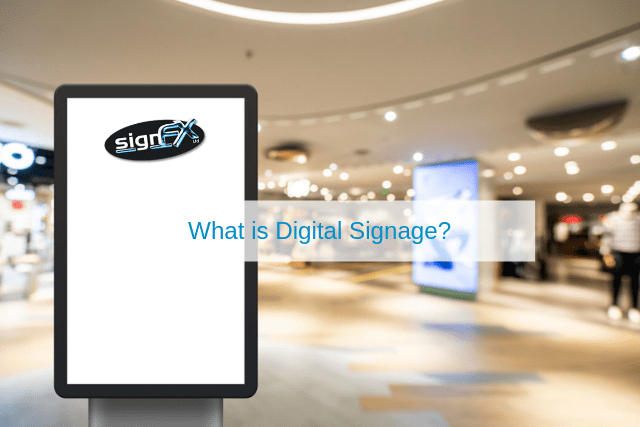 You Are Here: Home / Blog / Uncategorised / What is Digital Signage? Most of us are already familiar with traditional types of signage such as wood, vinyl and metal. However, modern times often dictate that equally modern solutions are employed. This is where the power of digital signage will often come into play. However, just how does this type of technology function? What are its main benefits and are there any potential limitations? If you have been looking to obtain professional printing services in Kildare, it is a good idea to examine the answers associated with these questions. Digital signage can often be found within public locations such as subways and throughout commercial districts due to the fact that it will immediately attract the attention of onlookers. What Advantages Can You Expect to Enjoy? Not only does digital signage represent an extremely versatile method to display a product or service to the general public, but it will illustrate that your firm appreciates the role that modern technology plays. This type of signage can also be managed remotely; allowing the user to change the design or message when the time is right. Updates can take place in a matter of seconds as opposed to waiting for a third-party technician to physically change the layout of the sign in question. On a final note, digital signage is able to provide the “wow” factor that is not often possible through the use of traditional advertising techniques. Are There Any Possible Drawbacks? You will be pleased to know that there are virtually no drawbacks associated with digital signs. In fact, the only real limitations are associated with your own imagination or the scope of your marketing campaign. If you would like to learn more about this innovative and eye-catching approach, please do not hesitate to contact a representative at Sign FX. You will be amazed to learn what can be accomplished!